We retired early to live our dream of being a full time Rver. We have camped thru all the provinces and 46 states. From May to October, we live in a 40 foot Grand Design Reflection 5th wheel in a seasonal park in Freelton, and travel around in a 30 foot travel trailer. 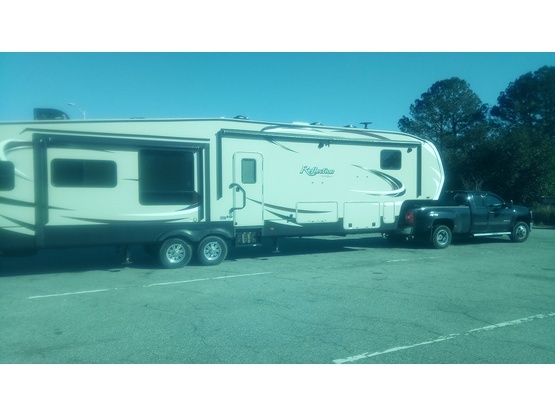 During the other months we are snowbirds who travel in their 40 foot 5th wheel. Bob loves to garden, golf and is a budding photographer. Virginia makes and designs greeting cards,stone coasters and decorates candles. She sells her products and also holds classes. We both love to hike, kayaking, see new places and enjoy the outdoors. We love meeting new people. We have also travelled by car around Europe and love to stay in bed and breakfasts, because we can meet people from all over the world. Virginia has also been to India and Mexico participating in service work thru the Girl Guides/Girl Scouts. Avid gardeners, loves golf, hiking, photography and crafts. Virginia Loves to cook healthy and try new recipes. She also loves to make crafts, and her passion is designing and making greeting cards.She is presently learning to make a blanket using the huck weaving or Swedish weaving technique. Bob is also a very good handy man. We have camped all over USA and Canada. So many fantastic locations to mention, hard to pinpoint the favorite as they all have their own charm, that is why travelling is so exciting. 2018 Reflection 367BHS 40 foot with 4 slides we pull it with a GMC diesel dually heavy duty. We pull this trailer when we travel down to the United States in the winter. While in Canada, we travel with a 30 foot travel trailer with no slides. We can't believe it's already time for Bob and Virginia to head back to the Great White North, but we are so glad (as always) that our friends came to visit with us again! We've only known them for less than two years, but they have became old friends. We always have a great time when they are around. Virginia loves to craft and cook, and Bob is a garden master and golf nut! We miss them everytime they leave!! Had a great time with swedish blonde and husband. She makes beautiful cards They love the outdoors and we enjoyed sharing a part of Mississippi and showing hospitality. Hope to see them again, maybe in Canada. Bob and Virginia were perfect guest at our place. We shared lots of stories and taught each other many card games. They are welcome at our place anytime. Safe travels. Great couple, very nice and friendly, it was a pleasure to have met them and are welcomed back if they are evere by this way again. We really enjoyed hosting this awesome couple. They are very knowledgeable and taught us a few things we didn't know about our rig and boondocking. We would welcome them back any time, even if we weren't home. We look forward to meeting up with them again in our future travels. Enjoyed their stay. They are welcome back anytime. Guest were very respectful. Hardly knew they were there. Very active couple so were gone a lot. Welcome back anytime. We had a Ton of fun with Bob and Virginia. They seem to enjoy many of the same things we did so we went hiking, kayaking, And golfing. We really enjoyed getting to know them. We would welcome them back anytime. Thanks Virginia for the beautiful greeting cards. This is the second time they have stayed with us and we could not be happier with them! They have been helping us around the house and saving me a lot of work! We might just keep them! I enjoyed hosting this couple. They are welcome back here again. I am sure you will enjoy hosting them too. 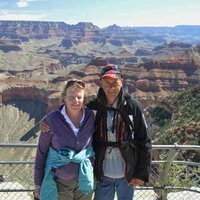 Charming and friendly couple with lots of RV experience, adventures and stories to share. Great times were had at the evening bonfires. They were patient and flexible as we had 4 different BDer rigs while they were here. (one with our first time hosting a family with 3 very little active young children.!!!) Virginia is very talented and crafts her own beautiful cards. Thanks for sharing them with us. Travel safe and enjoy the weather here before heading north. Welcome back any time. Know we will stay in touch and meet up again once we have the race truck running and hit the road. Bob and Virginia were wonderful guests. We completely enjoyed the company and conversations over a couple meals, a camp fire and just in passing outside. You could not ask for a nicer guest. Safe travels my friends, Linda and I will miss you but know we will cross paths again one day soon. Enjoyed having SwedishBlonde as my first Boondockers. I didn't get to spend much time with them as I had a trip planned to leave town. We did have an evening together and played a game of Sequence. They are welcome back. Glad they came back for a second visit! These guys are like our long lost family from the north! It was great having them around again for a second visit. We shared meals and homes and even had Thanksgiving dinner with the Amish! We can't wait until spring to see them again!! I always enjoy when "The Blondes" are here..... they are great company and helpful around the place....... I can't imagine anyone not liking them visit. Hope you can come back next trip north. We will try not to have snow. Wonderful guests. Fun to chat with, but not intrusive. We look forward to their next wander through Tennessee. More sharing of travel tales, some catching up and warm hugs at the end of the visit. We hope you have great adventures and definitely look forward to staying in touch. Bon voyage. It was a pleasure to have SwedishBlonde stay with us. It was great to hear of their interesting travels and experiences. They were very respectful of our property. We would gladly welcome them again. Getting to know our guests is always fun. SwedishBlonde were two very experienced RVers and we found we had lots of things in common including how we like to travel. Enjoyed sharing tips and photos and look forward to reconnecting when they come back. Another wonderful couple of boondockers. We enjoyed hearing their stories and hopefully picked up some tips. They are welcome to come back anytime. We wish them safe travels. This is a 2nd time hosting Bob n Virgina and was a great pleasure to have them again. Like always good conversations, good feast together. We even had a chance to go kayaking together. Virgina is very kind hearted and pampered me with beautiful gifts. Thank you again from the bottom of my heart. We will welcome them back again. Super clean n respectful couple. Down to earth, fun folks who were trying to get a real sense of the area by doing lots of exploring. Easy to have around and loved the Kawartha Dairy ice cream. Lots of photos taken and shared. Certainly welcome back any time. Oh, and Swedish Blonde can really maneuver that rig in tight spaces. Bob and Virginia are the perfect quest you could receive. We enjoyed our conversation and meals together. They have extensive experience in traveling and boomdocking to share for anyone who would love this adventure and new life style. Virginia has a beautiful talent with making gift cards which I wish we would of had more time for her to teach me. We will welcome them back anytime with open arms. Safe travels and hope to see you soon again. These guys are awesome, eh! Bob and Virginia are our new best friends! We have a lot in common and they were just a joy to have around. They have nice equipment, were super neat, and were no bother what-so-ever. Virginia even made us some cute gifts! These guys will always be welcome at Camp Carter! We enjoyed their stay here very much. Nice folks, lots of friendly, enjoyable visiting and conversation, they will be welcomed here, with opened arms, anytime they should need a place to stay again. Bob and Virginia were delightful guests with many stories of their travels and especially boondocking adventures. They have ignited the camping fire under us and we look forward to seeing them in our travels but more than anything, we look forward to their next visit. They are friendly, interesting and quite enjoyable. Thank you Bob and Virginia for choosing us. Swedish Blond and company were great guests, and we certainly enjoyed their visit. I’ve often said, “If you can’t be on the road having the road come to you is the next best thing.” It is always fun to meet up with other campers with shared interests, and in the case of Swedish Blond we had lots to talk about since we both own Grand Design campers. Hopefully our paths will cross again some day. SwedishBlonde are wonderful guest and have become friends. They fit right in with our other boondockers we have had staying at the same time. This is their second stay and they have purchased kayaks of their own and enjoying the river. We will welcome them back. Very nice couple. We enjoyed their stay however we stayed a distance from them because we had bad colds and we did not want to expose them to anything before their flight to Sweden the next week. They are welcome back. We loved having them here! So kind and great communication. Enjoyed having them stay with us. They are a very knowledgable couple with a ton of RV experience. I enjoyed getting to spend some time with them and discussing the RV lifestyle which we haven't started yet but are certainly looking forward to. They are welcome back anytime. Enjoyed having them stay with us. Very knowledgable couple with a ton of RV experience. Since we haven't started RVing yet, I enjoyed getting to pick their brains on subjects related to the RV life. They are welcome back anytime. Enjoyed having them here, great guests! Self sufficient, friendly and outgoing. We enjoyed having them and they're welcome back anytime. I hosted this couple for three nights, while other Boondockers were here. It was like a mini rally. We ate together, went sightseeing, and hung out in the driveway. I had a great time, I am looking forward to their next visit. SwedishBlonde stayed with us for three nights and we enjoyed having them. They are respectful and quiet guest. We visited with them a couple times and enjoyed hearing about their travels. Virginia makes greeting cards that looked so professional, I wish I had the time for a lesson. We would welcome them back again. 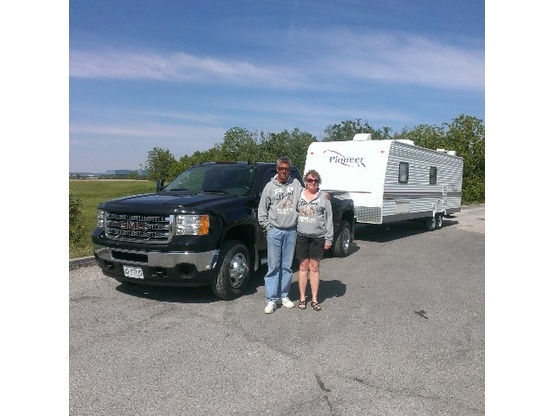 Great full time RVers! I didn't get to interact much because of my work schedule and our own camping. Everything went great! They are welcome back anytime! Great couple would recommend them to anyone [however Bob brings a lot of rain with him]W e hope to see them again real soon.